I'd always wanted to visit Asia, and back in 2013 when we started researching a trip we were undecided on where to go. Thailand, Vietnam, Laos, Cambodia? They all looked amazing and no doubt they are, but as soon as I saw pictures of Burma, or Myanmar if you prefer, I knew that was the place I wanted to see. There were so many places that I couldn't believe were real; a vast plain of 2000 ancient temples that is covered with mist in the morning, a lake where all the villages were on stilts and fishermen caught fish with baskets whilst rowing with one leg, a golden rock perched precariously on a cliff's edge, an old wooden bridge that carried people across a lake, and so many monks and nuns in their colourful robes. The reality is that these places are every bit as amazing in real life as I'd imagined them to be, and after travelling around the country we were utterly seduced by it's beauty, by the warmth and openness of the people, and by the incredible experience we had there. It's a wonderful place, and although tourism is growing fast, there are still so many elements that feel trapped in time which you simply can't see anywhere else in the world. My Photographing Burma ebook, which contains everything I learned about shooting in this incredible country and all the knowledge that would have been useful before going is available here. Lake Inle in the mountains of Shan State, central Burma, is a truly astonishing place. The lake has entire villages set on stilts above the water scattered all over the lake and entire communities and ways of life are centered around the water. Crops are grown in floating gardens, fabrics are produced in large wooden "factories" on stilts, and of course everywhere you go there are fishermen. I took this shot in the very last light of day before the sun dipped behind the mountains. A fishermen tends his nets as the sun sets at Lake Inle. A fisherman shows his incredible balance in the dawn mist on Lake Inle. A monk prays at Golden Rock as the sun rises on top of Mount Kyaiktiyo. One of the most sacred Buddhist pilgrimage sites in Burma, people travel from all over the country to touch, apply gold leaf and pray at Golden Rock, a huge boulder balanced precariously on the edge of a cliff. Legend has it that the rock is held in place by a single strand of Buddhas hair. We travelled here from Yangon, spent the night at the temple site, and woke up before dawn with all the other pilgrims to see the sun come up over the mountain. The atmosphere was full of incense as thousands of people gathered around the rock. An unforgettable experience. A monk walks along the edge of the stupa at as the day's last light illuminates the golden Shwedagon Pagoda in Yangon. On our first evening in Burma we went over to Shwedagon and found it full of thousands of local people come to pray, burn incense and just soak up the atmosphere in Burma's most religious location. Legand has it that Shwedagon Pagoda has existed in one form or another for 2600 years and it's impossible to go there and not be impressed by the sheer size and of the 100 meter high gold covered stupa. We met this group of young Buddhist nuns just as they were about to leave a temple in the back of a small truck and were lucky that they were really happy to have their photograph taken. The fun in situations like this is seeing their smiles and laughter when you show people their photos on the back of the camera. Bagan is certainly one of the highlights of any trip to Burma, nothing could have prepared me for the majesty of the place on my first misty morning there. This has to be one of the most stunning places to see the sunrise on the planet. A vast plain covered with temples, it's certainly one the most amazing mornings I've ever had photographing the dawn. I shot for almost 3 hours at the top of a temple, from pre-dawn through the sunrise, and finally capturing warm light on the temples nearby. Another image from a wonderful sunrise at the temples of Bagan. The plain of Bagan has around 2000 temples scattered over a few square kilometers, and in the morning mist rolls access the plain and the neighboring River Ayerwaddy, making each temple appear like an individual island in the fog. It really is a remarkable scene. The terrace of Pythanda temple in the centre of the plain of Bagan is a huge and free of a lot of the crowds that gather at many of the other temples for sunrise. A shot of a novice monk in front of the reclining buddha at Shwesandaw Paya, Bagan. As we entered the tiny building where the buddha is located we came across a photographer shooting this scene. It's not a "natural" scene, as the photographer, who was shooting a book in Burma, had a guide who'd set up the scene for him complete with local novice monks who were carefully posed and lit. The photographer invited me to take a shot of the scene and even though I'm generally not a big fan of contrived posed scenes like this, I wasn't going to decline. 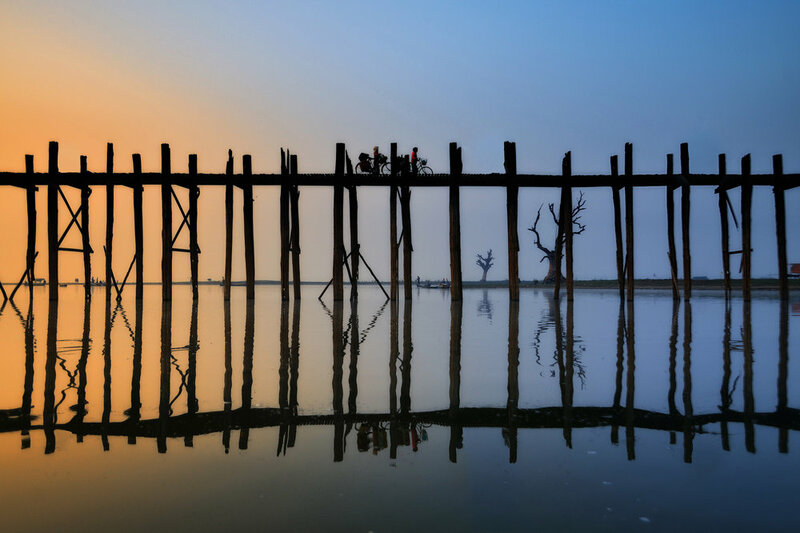 The U Bein teak bridge across Tuang Tha Man lake in Amarapura, Mandalay, is the longest teak bridge in the world. Over a kilometer long and more than 150 years old, it spans the large lake and is an incredibly busy passageway connecting the two banks. I was there for dawn when it was (just a little) quieter, but even at that time the bridge thronged with people going about their business and monks crossing to get to some of the large monasteries in Amarapura. U Bein bridge in Amarapura, southern Mandalay, as the sun burns through the mist at dawn. I set off in a boat when it was still dark and misty and photographed the bridge as it got busier and busier with early morning commuters. A fisherman casts his nets below U Bein bridge in Amarapura. Mahagandayon Monastery in Amarapura, Mandalay, is one of the largest monasteries in Burma. At around 10 in the morning all 2000 monks who live there form lines to enter the eating halls and take their lunch. Scattered at roadsides throughout Amarapura and Mandalay are lots of stone carvers who shape and carve slabs of stone into buddhas of all shapes and sizes. Watching the carvers work on buddhas in various states of completion is a fascinating process as they hone the statues into their finished forms. It’s brutal work and after just a few minutes standing watching you’ll feel the dust in your eyes and throat and yet the men here work without goggles or masks breathing the dust all day long, day after day. Mingun Paya is a huge half-built stupa across the river Ayerwaddy from Mandalay. It dates back around 200 years and had it ever been finished it would have been the largest stupa in the world, standing around 150 meters tall. I captured this as the days last light caught the stone at the rear of the stupa.